Sure, the costuming by Donna Lawrence-Downs is ancient Greek, but the cartoon-quality aesthete in the look and action is so farcically modern it only makes sense that Ephesus would be the hub for UPS. 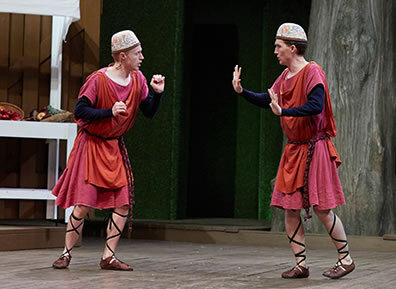 Dromio of Ephesus (Tony Milder, left) meets his twin brother Dromio of Syracuse (Neill Robertson) for the frist time since they were separated as babies in the Kentucky Shakespeare Festival production of William Shakespeare's The Comedy of Errors. 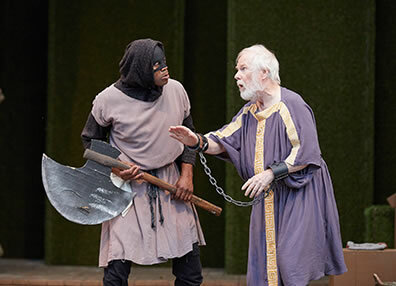 Photo by Bill Brymer, Kentucky Shakespeare. Antipholus, who hails from Syracuse, is newly alighted in Ephesus. This is ancient Ephesus (that the Apostle Paul addressed in one of his letters), so Antipholus is dressed as if he stepped off of a Phoenician amphora, wearing a yellow, knee-length tunic and sandals with cross-straps up the shins. Actually, he looks more like he came out of a Disney rendition of classical Greek societies, so the tunic is bright yellow and sporting an ornate gold-scrolled blue trim. Antipholus has sent his servant, Dromio, to check in at the inn, he's bespoken dinner with a merchant, and he sets out to "wander up and down to view the city." The first thing he spies is a UPS jetliner flying low overhead as it approaches Ephesus International Airport. Antipholus stops his meditation—"I to the world am like a drop of water that in the ocean seeks another drop"—and stares up in awe at this wonder of the city. That's all Crystian Wiltshire, the actor playing Antipholus of Syracuse, can do in this Kentucky Shakespeare production of William Shakespeare's The Comedy of Errors in Louisville's Central Park, which just happens to be on the approach path to UPS's North American hub. This major economic engine for the community can be an occasional irritant to actors, audiences, and neighbors alike, and at one performance, UPS intervened in the Abbess's great reveal near the end of the play. Still, the two or three flyovers per show—and, more importantly, Wiltshire's in-character reaction—are part of the Kentucky Shakespeare Festival's happening scene. Louisvillians of all ilk gather by the thousand in the park's C. Douglas Ramey Amphitheater in the heart of Old Louisville, a neighborhood of early 20th century residences a couple miles south of downtown. Many arrive two hours before showtime, making jacket dibs on prime seats, spreading out picnics on the adjoining lawns, partaking of the fare from food trucks contracted with the festival, watching an opening act of some community talent, and enjoying an intelligently staged Shakespeare play featuring high-quality acting. 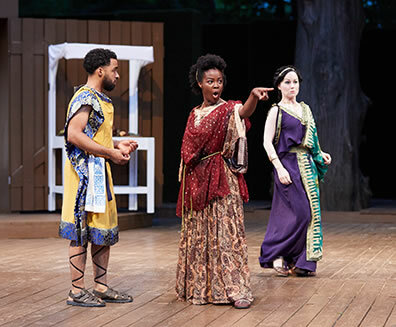 The nation's oldest free-Shakespeare-in-the-park festival, which tottered on the brink of bankruptcy seven years ago, is these days soaring on all engines, starboard and port, under the guidance of Artistic Director Matt Wallace. Antipholus's UPS flyover moment also fits the loony tone of this Wallace-helmed Comedy of Errors. Sure, the costuming by Donna Lawrence-Downs is ancient Greek, but the cartoon-quality aesthete in the look and action is so farcically modern it only makes sense that Ephesus would be the hub for UPS. Wallace embraces the ridiculousness of a play about two sets of twins sharing names (Antipholus and Dromio) separated near birth and accidentally showing up at the same time in famously mystical Ephesus, where they confuse wife, courtesan, merchants, and each other while, unknown to them, their father, Egeon, faces a death penalty for violating an arcane edict. The cast performs all of this with heightened physicality and easy sight gags (beards as erogenous zones, as Adriana and the Courtesan need only stroke an Antipholi's facial hair to get him to do anything). The actors even overly emote their lines. As the plot heightens, every mention of the item that the Goldsmith gives Antipholus is spoken in all-caps: "CHAIN." The two Dromios (Neill Robertson of Syracuse andTony Milder of Ephesus) shamelessly play Laurel/Costello/Lewis to the Hardy/Abbott/Martin of the two Antipholi (Wiltshire of Syracuse and Shaleen Cholera of Ephesus). Nevertheless, the cast delivers Shakespeare's verse with distinction, dramatic tension gurgles beneath the comic surface, and the play's romantic heart beats strong enough that when the Abbess (Jennifer Pennington)—when unencumbered by low-flying jets—identifies herself as wife of Egeon and mother of the Antipholi, a gasp ripples through the audience and several sentimental eyes are dabbed. In the litany of wonderfully fun performances, we start with Dathan Hooper as the Jailer. He speaks only a couple of lines and appears only in the play's first and final scenes, but his antics have us dabbing at our laughing eyes. An executioner by trade, head hooded, his face masked, and carrying an oversize halberd, he first appears menacingly escorting Egeon (Monte Priddy), who is carrying a bloody basket that is to be the receptacle for his own head. The Syracusan merchant has been condemned for coming to Ephesus against the edicts of the two city states (Antipholus and Dromio of Syracuse are warned by the merchant to keep their heads down, but they don't have to worry because they look and are dressed exactly like two longtime Ephesus residents). Without benefit of facial expression, Hooper portrays affectionate attention as Egeon's tale unfolds in the first scene. He shifts from being a menacing spector to being a menacing spector taking tender care of his charge's comfort, crying as he listens to the separation of Egeon's family in the shipwreck, and interceding when Egeon tries to cut off his own head with the halberd (this Egeon is so forlorn and ready to die that the Duke's giving him a day to find a ransom ticks him off). In the final scene as revelations rescue Egeon, Hooper's still menacingly hooded-and-masked Jailer skips in place and claps his hands like an excited preschool boy at Christmas. Upon the Abbess's invitation for everybody to feast in her home, the Jailer adjusts his simple tunic and hood to be more presentable in good company and goes skipping across the stage with his halberd on his shoulders. That such a small part stamps an indelible presence on our psyche is a credit to Hooper, who, it must be pointed out, will be playing Othello in this repertory season (as well as Sir Walter Blunt in Henry IV, Part One). The presence on this stage of this veteran actor with impressive credits in Louisville and in Los Angeles theaters points to the strong ensemble Wallace has put together for this season. Tiptoeing the ledge that separates effective hyperemoting from over-the-top acting are the sisters, Adriana (Abigail Bailey Maupin) and Luciana (Ernaisja Curry). As the neglected wife of Ephesus's Antipholus, Maupin's Adriana is the ultimate drama queen, gnashing in jealousy one second and sighing with romantic idealism the next. Curry's Luciana shadows Adriana's declarations like a Pentacostal parishioner reacting to a sermon. She nods emphatically for all the blessings her sister bestows on Antipholus and Dromio. She shakes her head admonishingly at the evil her sister must endure at the hands of Antipholus and Dromio. She gesticulates hosannas because a text-centric production won't allow her to shout hallelujah when the spirit moves her, which is pretty much every other line. A simultaneous strength and weakness of The Comedy of Errors as a piece of theater is the roles of these two women. Despite the comic mayhem happening around them, Adriana's is a serious part, and Luciana thematically can be left out to dry (I've seen her portrayed as a bookworm, a mouse encasing a super freak, an ironically disinterested millennial, and I don't remember the rest). I've seen Adrianas merge fierce feminism with seductive attitudes to achieve comic gold, and Maupin achieves that in this production while Luciana achieves laughs aplenty in her own right by turning indignation into religious fervor. 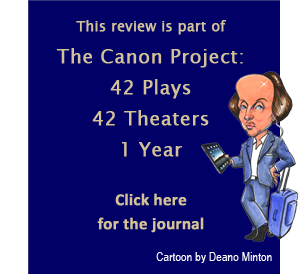 The pair achieves some of the production's most rollicking scenes, which is saying a lot considering how well the rest of the cast pulls off the play's parade of naturally rollicking scenes. Top, the Jailer (Dathan Hooper) listens to Egeon (Monte Priddy) tell his tale in Kentucky Shakespeare's The Comedy of Errors. Above, Luciana (Ernaisja Curry, center), and her sister Adriana (Abigail Bailey Maupin) accost Antipholus of Syracuse (Crystian Wiltshire). Photos by Bill Brymer. Theatrically riffing off these two are the Dromios. Milder's Dromio of Ephesus is so used to being around these two women that he behaves with comic resignation when he's in their presence. In a nice touch of line-reading, the way Maupin and Robertson banter about time indicates Dromio may be as much a jester to Adriana as he is to Antipholus. She genuinely appreciates Dromio's wit in this scene—though he's the wrong Dromio. Robertson's Dromio, in fact, has no idea who the heck these people are. As Adriana carries on with one of her hyperdramatic tirades toward his master (but not her husband), Robertson turns to the audience with a "can you believe this?" look, but suddenly finds himself facing the apocalyptic roar of Luciana's six-winged lion. The two Antipholi remain in perpetual states of perplexity, Cholera's Ephesian from the moment he first appears on stage reporting on his encounter with Dromio talking wildly about meeting him earlier in the marketplace, and Wiltshire's Syracusan from the moment he spies that UPS jet flying over the marketplace moments before the Ephesian Dromio shows up to fetch him home to dinner. The casting of Robertson and Milder as the twin Dromios was a natural phenomenon begging to happen as both Kentucky Shakespeare veterans have often been confused for each other over the years. They look almost identical (Milder has slightly redder hair, Robertson has slightly longer hair), and they are mirror images in the way they walk, talk, physically express themselves, and eat apples. Wiltshire and Cholera are close enough in physical appearance to be believably confusing, but Shakespeare notably makes the personalities of the Antipholi significantly different from each other. Cholera and Wiltshire play to those differences. It's an obvious nuance in this production, but one lost on a ticked-off wife, a more-ticked-off sister-in-law, their servants, and the people of Ephesus—and even their father. As he plays up the comic aspects of The Comedy of Errors, including in Egeon's opening scene, Wallace makes a theatrically surprising but socially aware choice of dropping the play's funniest set piece: the Syracusian Dromio describing Nell, the "spherical" kitchen wench, as a globe whereon he can "find out countries in her" (Nell, played by Pennington, does appear during the gate scene carrying a headless chicken and a bloody cleaver which is enough to disconcert Dromio of Syracuse). Wallace told me in an interview that the play was funny enough without resorting to a fat-women joke and saw no need to even broach offending anyone with it. Some will argue with him on the grounds of political correctness (I don't; I consider political correctness simply good manners and respectful treatment of others, so I score that argument for Wallace) or on the grounds of textual purity (though he excised the passage; he didn't alter it, so he gets the point in this volley, too). My argument is totally selfish: given the chemistry between Wiltshire and Robertson, I want to see their take on finding Ireland, Scotland, France, England, Spain, America, and the Netherlands in a woman literally crushing on Dromio of Syracuse (but actually betrothed to Dromio of Ephesus). Writing this description, I see the entire gag to be full of un-PC images, but Shakespeare, as he always does, counters such jokes with a poignant truth: One Dromio may find Nell repulsive, but the other finds her lovely, which does come through in Wallace's staging. Nuances. This play is full of them. It's full of laughs, too. Wallace and his cast emphasize the laughs, and wheter or not everyone in the audience picks up on the nuances they are thoroughly entertained. Most important is that the actors know the nuances are there, and because they do, they mold their exaggerated performances with human truth. The preshow entertainment on this night showcases Kentucky Shakespeare Festival's contribution to the I Am Ali Festival honoring the late Louisville native son, boxer Muhammad Ali. The program includes a dancer, two young students reading their essays on Ali's six principles to live by, and "a battle of wits between the greatest wordsmiths the world has ever known, Ali vs. Shakespeare." Ali wins, and I have to admit that when it came to one-line zingers, he was The Greatest. But let them face off in playwriting or long-form narrative, and Shakespeare retains the belt.